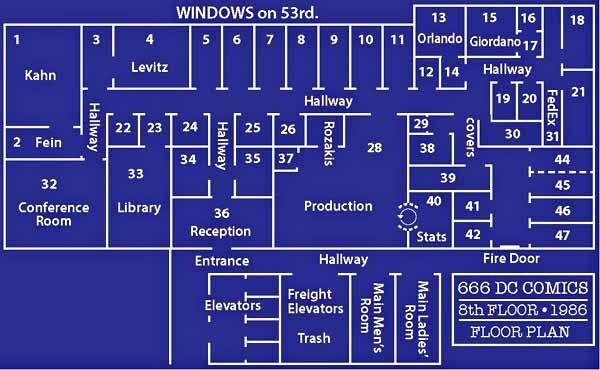 Here’s a floor plan of the DC Comics offices at 666 5th Avenue in the later half of the time there, from about 1986-1991, designed by Steven Bové with tweaking by me. Again, we have no actual plans to go by, this is based on the collective memories of staffers who worked there, including myself, Bob Rozakis, Richard Bruning, Bob Greenberger, Mike Carlin and many others. There are bound to be errors of proportion and perhaps even number of rooms in some places, but it’s reasonably close. I’ve put in a few names for those whose offices remained the same throughout the 666 years, but for some reason unknown to me, personnel changed locations often, making it hard to remember or pin down who was in each office or area. In the following article we’ll be referring to offices by room number, but memory is a tricky thing, and I’ve received some conflicting reports on who sat where, so we’ll just do the best we can. On the business side of things, it’s harder to track personnel except for those at the top level, who sometimes appeared on the indicia page of collected editions beginning around 1987. Some of the lower level workers in areas like Marketing, Circulation and Accounting did not get their names in print or identified in photos I have, and unfortunately can’t be included here. Speaking of the business side, Ed Shukin appears as Vice President – Circulation and Patrick Caldon as Controller in the 1987 Graphitti Designs hardcover edition of BATMAN: THE DARK KNIGHT. Shukin came from a similar role at Marvel. 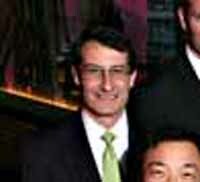 I have no information on Caldon, but he replaced longtime head of DC Accounting Arthur Gutowitz. 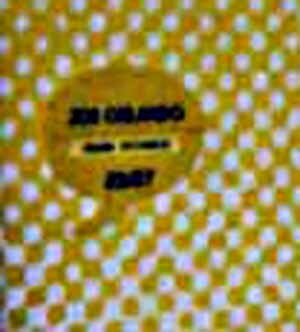 Caldon, still with the company in 2010, is shown in a photo of that vintage above, I haven’t found one of Shukin. 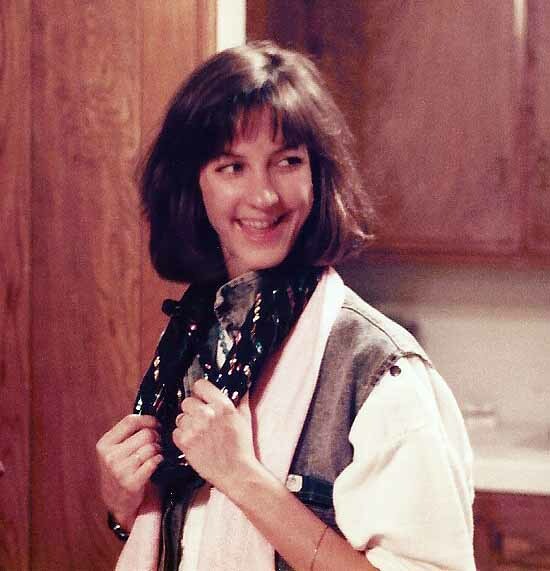 Linda Robak, 1985, photo by Tom Mason. Linda Robak followed Mike Flynn as Advertising and Sales Manager from 1984-1986, working alongside Peggy (May) Ordway. Both worked under Bruce Bristow, who remained the Marketing Director for most or all of the 666 years. Here’s Matt Ragone who replaced Ed Shukin by 1988, when he’s first listed as Circulation Manager. Photo from 1994 by Justin Nisbet. 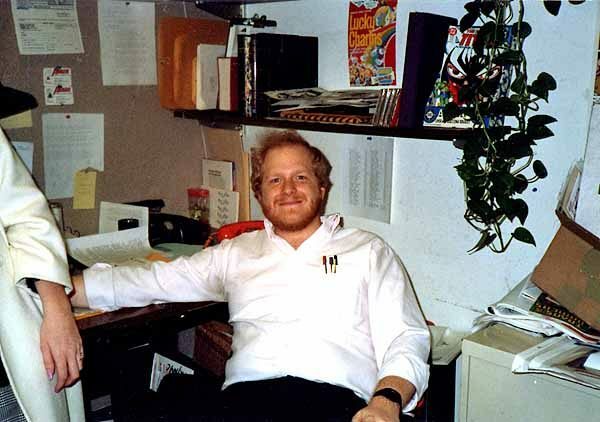 In 1987, Bob Wayne joined the DC sales team, and over the next few decades helped shape the direct market for selling comics as we know it today. He retired in 2014. Undated photo found online. Other business personnel names I have without pictures are Marilyn Drucker, Licensing and Tom Ballou, Advertising Director (hired in 1988). Before going further, I have to acknowledge this article by Robert Greenberger in BACK ISSUE #80, May 2015. It covers written or transcribed remembrances by staffers of many of the office locations, including 666 5th Avenue. I’ve already quoted from it a bit, with permission from everyone involved, and will do so more heavily in this part of my article. Thanks to Bob, magazine editor Michael Eury, and those quoted. 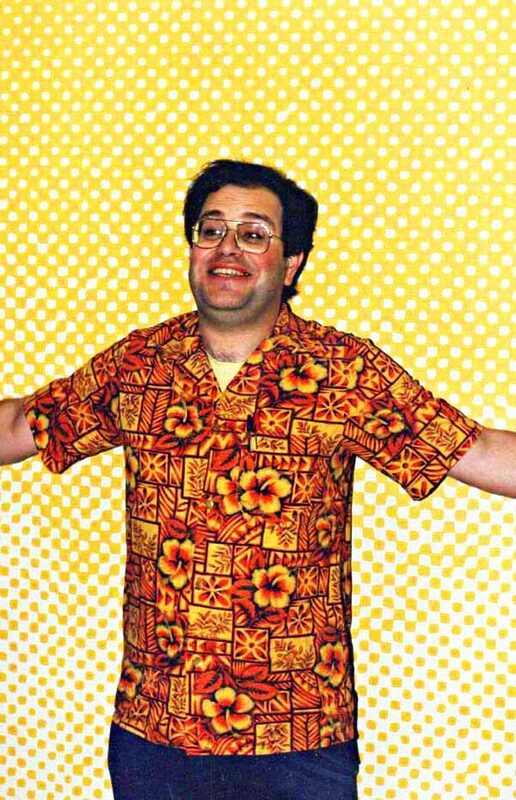 Many who visited the offices were amazed, stunned, or otherwise assaulted by the loud yellow-dotted wallpaper, modeled here for us by Production Manager Bob Rozakis, and clearly triumphing over his Hawaiian shirt. Indeed, photos don’t really capture its bright golden yellow brilliance. Former editor Mark Waid reports that it was designed by famed graphic designer Milton Glaser, a friend of publisher Jenette Kahn, at her request. Glaser had also designed the DC Bullet symbol for her, the fifth one in the logo lineup above, as well as revamping the Superman and Wonder Woman logos (or at least, his studio did). The wallpaper was the kind of thing that probably looked like a fun idea small, but when enlarged to wall size became the stuff of headaches and nightmares. Waid reports that Jenette had extra rolls stashed in her office in case of damage or perhaps an employee berserk rage event. Fortunately it was mostly on the hallway walls, not in the rooms and offices. 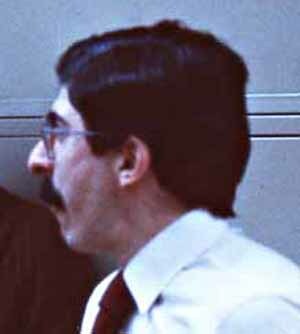 “In September of 1984, I was a fanzine writer and editor who’d been invited by SUPERMAN editor Julius Schwartz to pitch some story ideas. In my enthusiasm, of course, I arrived something like five hours early and Bob Greenberger and Barbara (then Randall) Kesel took me under their wing and showed me around, and no child’s visit to Disneyland was ever more special than that visit to me. “A very charming woman named Ruthie Thomas worked reception—a small waiting area where visitors sat next to a statue of Clark Kent reading the Daily Planet. (Ruthie was great.) Through the top half of the always-open Dutch door that gated reception from the main office, you could see a little bit of office buzz, but not until she allowed you access were you in the thick of it. “Just past reception was a short hallway maybe 30 feet long (newsstand circulation offices on the left, marketing offices on the right). At the end of the hall, a left would take you to the executive offices of Paul Levitz and Jenette Kahn and to the library. Well said, Mark! I felt exactly the same way when I first entered the library myself in 1977 (at the previous offices). And as the library was not staffed then, I was allowed in there by myself during lunch breaks to browse, and even allowed to take bound volumes home to read. 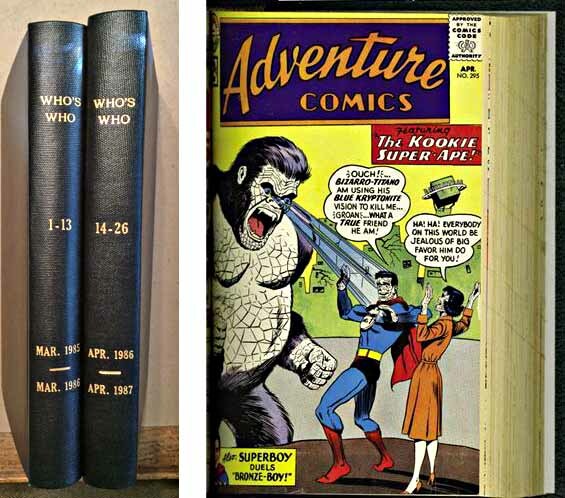 I read the entire runs of MYSTERY IN SPACE and STRANGE ADVENTURES that way. Things changed at 666, library security was tighter. I’m not sure if Allan Asherman had become the staff librarian when Mark visited in 1984, but that happened some time in the mid 1980s. Here’s the only photo I can find of Allan by Bob Rozakis from 2011. 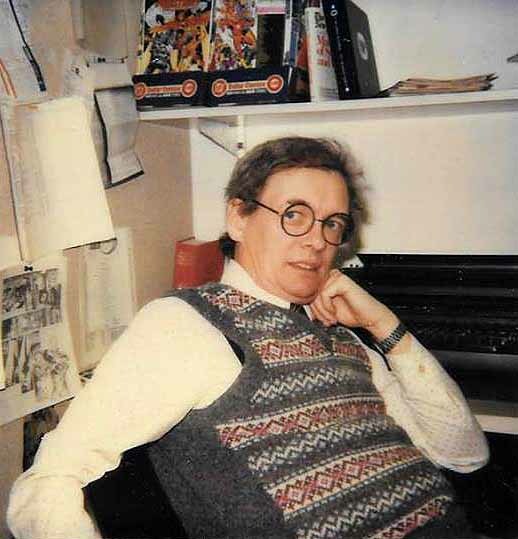 Asherman held forth as company historian and library protector for decades, after an early career as a comics fan and writer. I believe he was in office #23, which became a closed-in portal to the library. I agree with all that except for the description of “large.” It may only have been considered large compared to some of the editor’s offices. I mean, that couch seats three people at best, and you can see from the wall corner on the right there’s not a lot of hall in front of it. 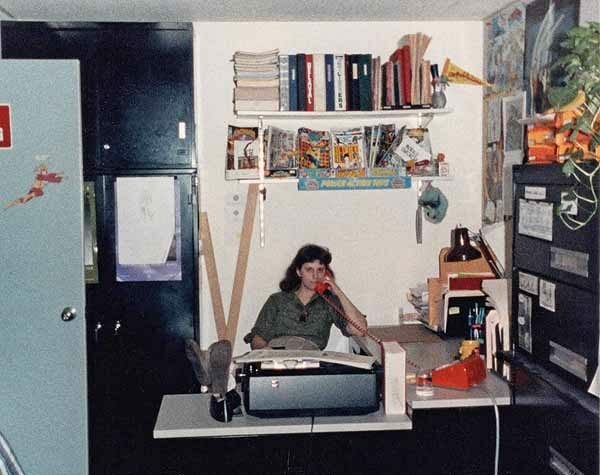 Looking the other way from that point, here’s the tiny coffee room, #29, in the background behind editor Archie Goodwin wearing a Donald Duck hat. No idea why, but it reminds me of how funny Archie could be. Photo by Curtis King. 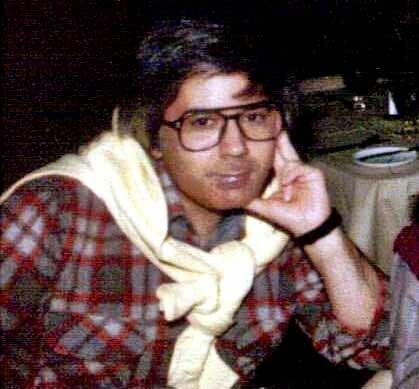 Archie had two stints as editor at DC, the first in the early 1970s, the second beginning in 1990, the date of this photo. He was considered by many, including myself, one of the best editors ever in comics. The area marked 31 and Fedex was where editorial photocopying and shipping happened, with a young staffer to handle that. Bob Greenberger remembers some of the people in that location and position as Eddie Berganza, Mike McAvennie, Frank Pittarese and Dan Thorsland, all of whom moved up to editing later. In the 666 years, shipping art by Fedex became ever more popular, especially when DC paid the shipping bills. Fedex was usually much faster and more reliable than regular mail then, and at Warner Communications corporate rates, not too costly. Fedex allowed freelancers to spread out across the country and across the world without missing deadlines, assuming they got the work done in the first place. 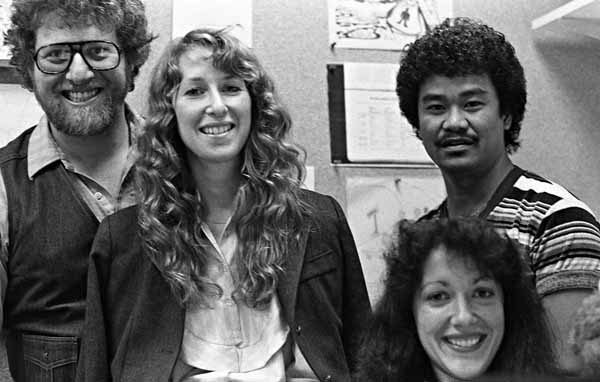 Here’s Janice in 1983 with editors Len Wein and Karen Berger, as well as production artist Albert DeGuzman, who provided the photo, probably taken in Len and Janice’s office. Another feature of the office design I haven’t mentioned yet were the word-balloon shaped name tags outside office doors. 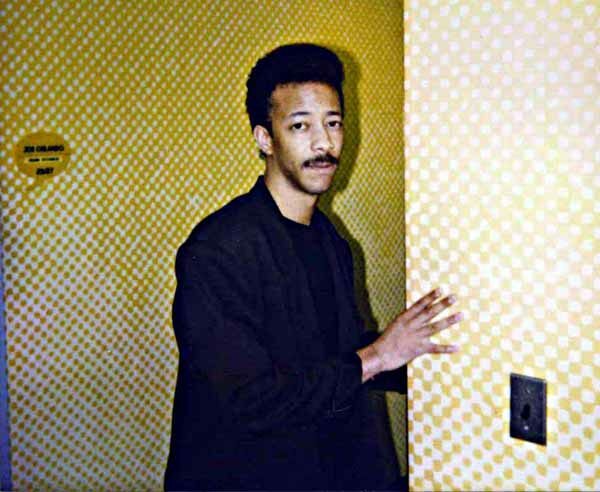 You can see one above for Joe Orlando in this photo of artist Denys Cowan by Curtis King from 1990. 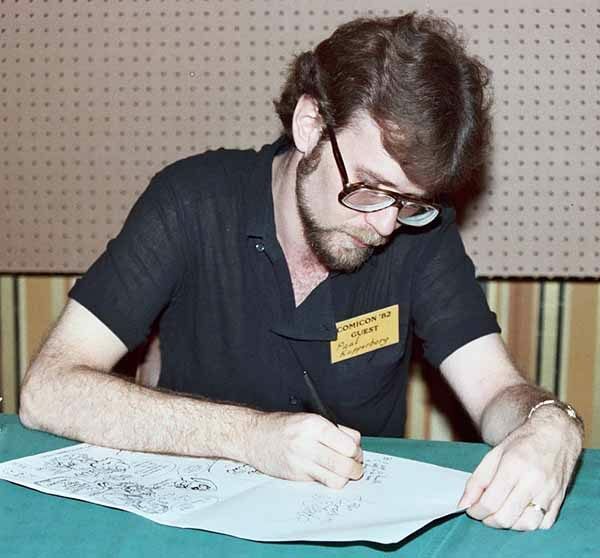 Paul Kupperberg, 1982, image found online. 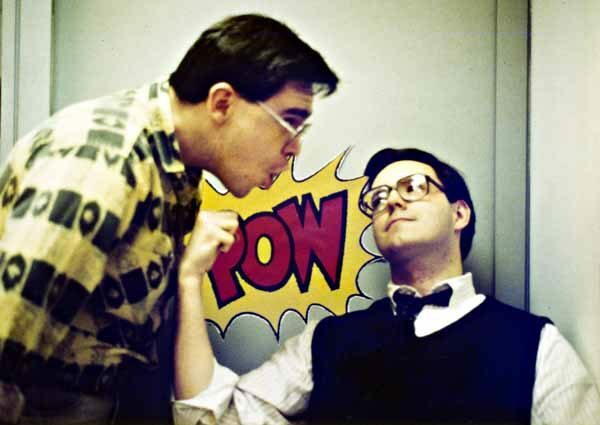 Some time in 1985, Neal Pozner left staff, though he continued to do some freelance work for the company, and was replaced by Richard Bruning, seen here in a 1985 photo by Albert DeGuzman. Richard told me, “I got what I believe was Neal’s office. 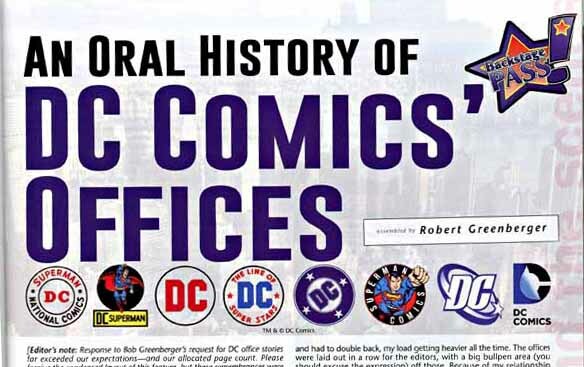 It almost went to someone in Marketing, but I talked them out of that.” Richard’s title was originally Art Director, and he worked on all aspects of the DC look from covers to logos to trade dress, as Neal had. Richard also did some writing and editing for the company. He was later promoted to Design Director. 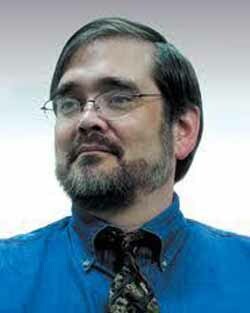 He left in 1990, but returned to DC in 1996 as Vice President—Creative Director until 2010. He’s perhaps best known for the cover design work on WATCHMEN with artist Dave Gibbons, and the Vertigo logo. 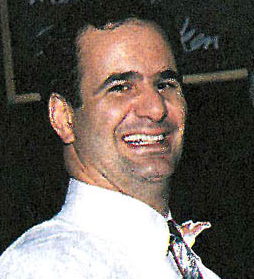 Neal Pozner also returned to DC from about 1990 to 1994 as Group Editor, Creative Services. At that time he was instrumental in recruiting new talent, some of whom have become industry stars. Another photo of Barbara looking fiercely at photographer Mike Carlin. 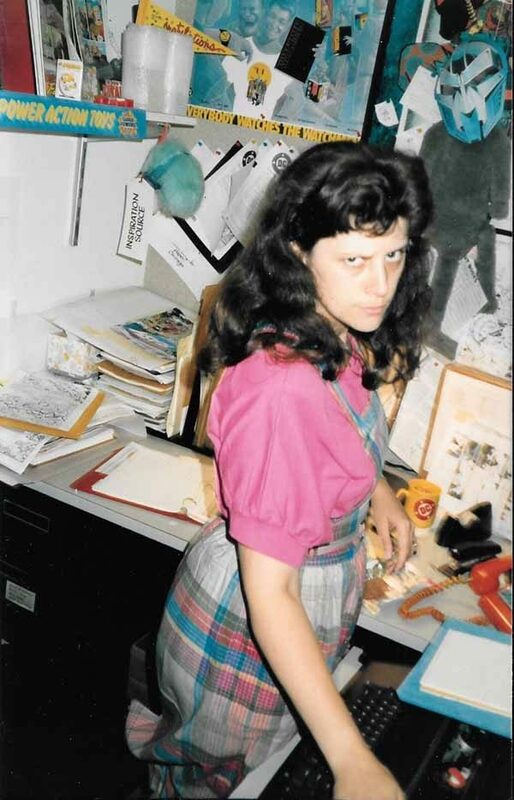 Barbara remembers being moved a number of times, first to room 47 with Nick Cuti, then back to room 21, then into 45, which she shared with Mark Waid. 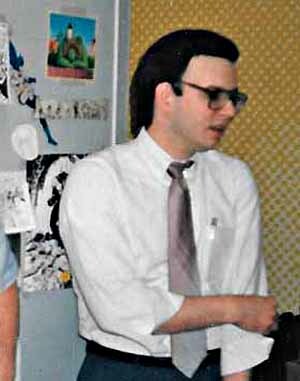 Sal Amendola, seen here in a 1985 photo by Bob Rozakis, joined the DC staff as a part-time editor near the end of 1984. He was also teaching at the School of Visual Arts, and had a mandate to work with new talent, which he did on NEW TALENT SHOWCASE and ELVIRA’S HOUSE OF MYSTERY while they lasted. He left staff in the spring of 1986. His office was probably #45. 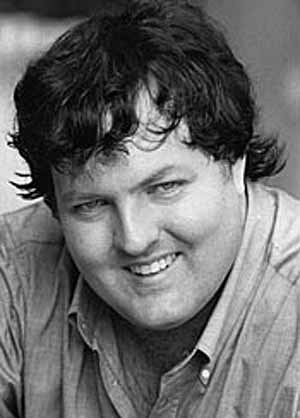 Cary Bates, seen here in an undated photo found online, had been writing for DC for years, and in the fall of 1983 he began editing THE FLASH, a title he was also writing. He was a part-time editor on just that title, and continued to be until the summer of 1985. 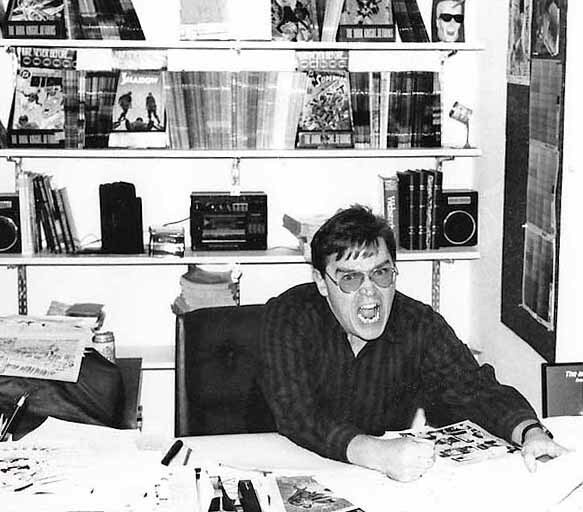 Mark Evanier was another comics writer given the editorial reins of a book he was writing, BLACKHAWK, from about November 1983 to November 1984, undated photo found online. Mark lived in California, so would not have had office space. 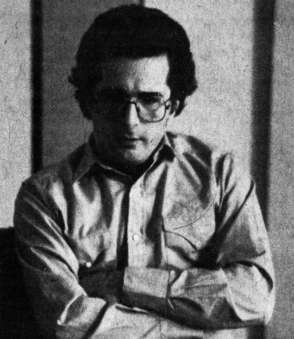 Writer Michael Fleisher had been working for DC for many years, and in early 1984 began editing JONAH HEX, a title he was writing. That continued with a relaunch called simply HEX until it ended in early 1987. 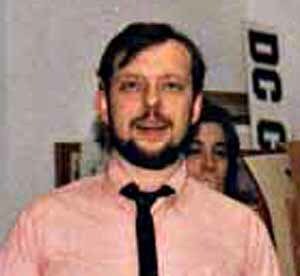 Mike W. Barr, seen here in a photo from Michael Eury, had worked on staff as an editor at DC in 1981-82, then left to write full-time. In the spring of 1984 he returned as a part-time editor for books he was writing, and visited the offices regularly. That lasted until the spring of 1987. 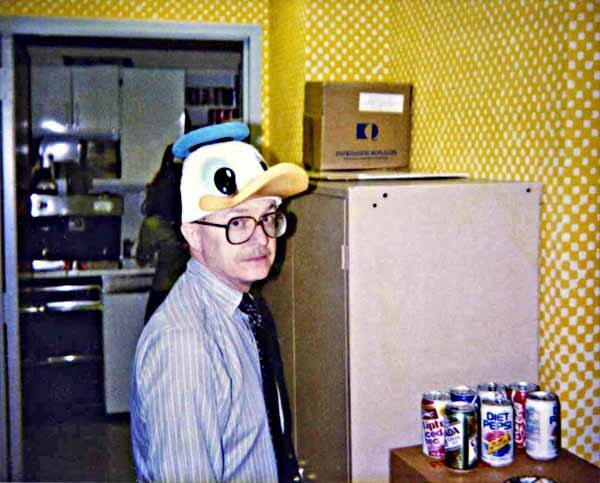 Denny O’Neil in his office, 1986, photo by Ray Alma. 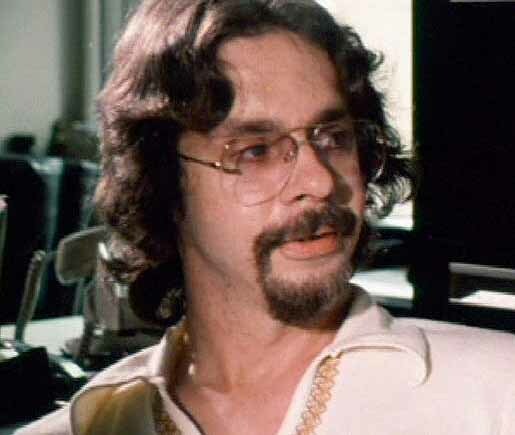 Dennis “Denny” O’Neil, seen here in an early 1970s photo by Jerry Bails, had two stints as editor at DC, the first from 1972 to 1973, the second beginning in early 1986 and continuing until his retirement around 2003. For much of that time he was the Batman editor or group editor. 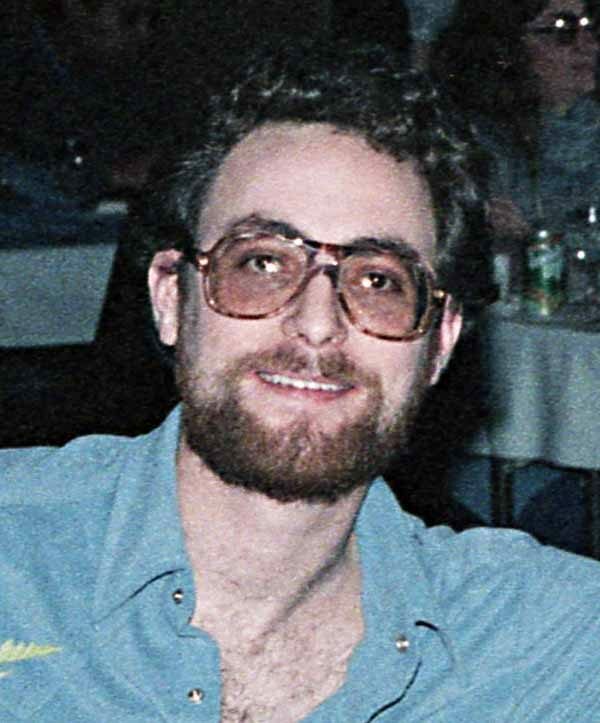 Bob Greenberger in a 1985 photo by Albert DeGuzman. That latter job involved lettering and coloring assignments, which meant I saw and heard a lot from Bob, who was always helpful and generous with work assignments. Jonathan Peterson. 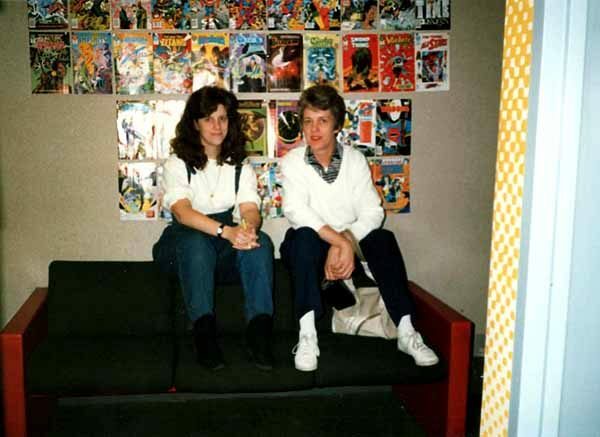 seen here in a photo by Mike Carlin, joined DC as an assistant editor in the summer of 1986, and before long was editing his own titles. 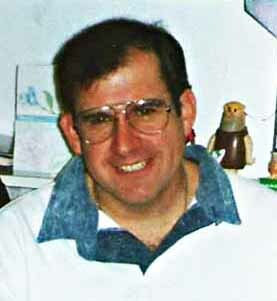 Mike Carlin in his last office, photo supplied by him. 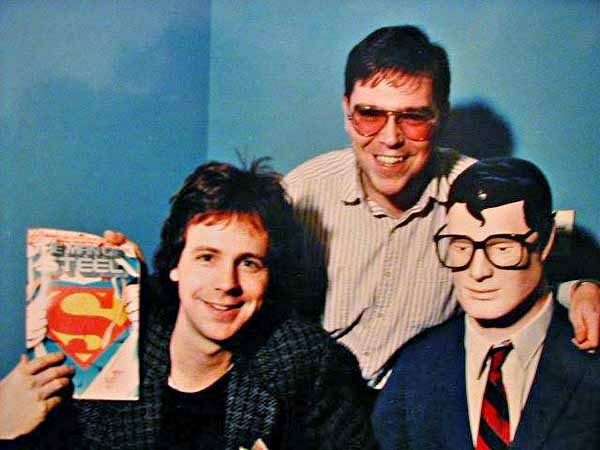 Comedian Dana Carvey with Carlin and Clark Kent in the DC reception area. 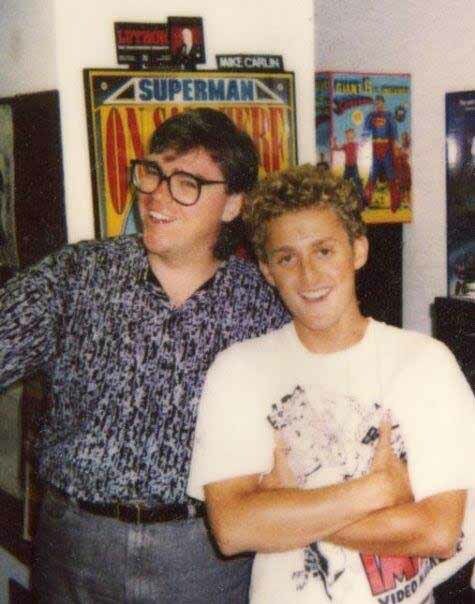 Carlin with his assistant Jonathan Peterson, photo by Jerry Ordway. 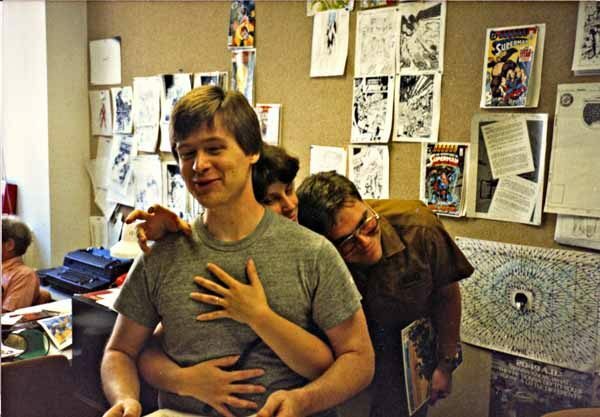 Karl Kesel, Barbara Randall Kesel and Carlin in his office in room #18, Denny O’Neil in the background, photo by Jerry Ordway. By the way, have you noticed how many people remember being in office #47 in the New Construction area? Ed Hannigan also told me his office was there. Two remember being in #45, one in #41. I have removed office #43, as evidence suggests there were only two small offices there, not three. On the other side, the information on offices 44 to 47 is contradictory from several sources, but rooms 44 and 45 were combined into one at some point. Possibly a few folks are off by one room or another. Memory is, indeed, a tricky thing. Here’s a rundown of who edited which DC comics with April 1986 cover dates, to fill out the editorial picture. KAREN BERGER: Amethyst Princess of Gemworld, Tales of the Legion of Super-Heroes, The Legion of Super-Heroes, Legionnaires 3, Swamp Thing. As before, titles that did not see print that month are not included. Next time I’ll continue with fun events in the production room, and more new faces. Other parts of the article, and more you might enjoy, can be found on the COMICS CREATION page of my blog. This entry was posted in Creating Comics on August 4, 2016 by Todd. sorry to be a pain, but the guy in the first pic isn’t Patrick Caldon. That’s actually John Rood, Executive Vice President Sales, Marketing and Business Development when they formed DC Entertainment in 2010 and no longer with the company. Thanks, I appreciate the correction. Fixed. The photo by Cary Bates is a snapshot a Superman: The Movie making-of documentary done by WB between 1977 and 1979. Horribly minor comment: Schwartz probably didn’t edit Shadow of the Batman. 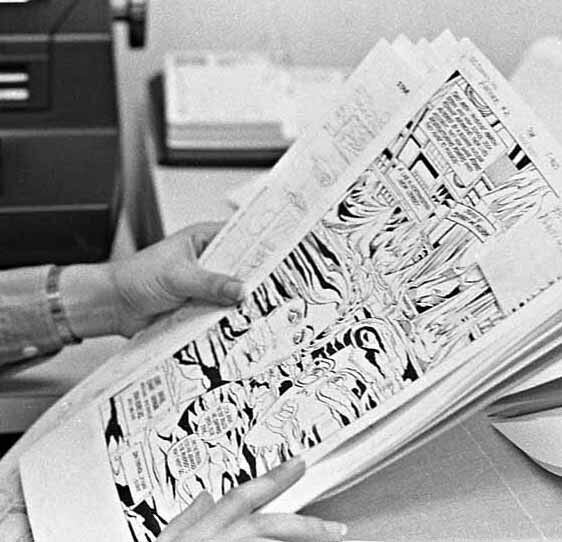 The comics didn’t list anyone beyond the original editor credit. Maybe Nic Cuti and/or Barbara Kesel? Wasn’t Andrew Helfer the first Superman editor after Julie, then Helfer and Carlin, then just Carlin? You’re right. I’ve amended the post. Since Andy was there only a few months, I’d call it a transitional period. I believe you are correct about Pat Caldon and Matt Ragone replacing Gutowitz and Shukin. 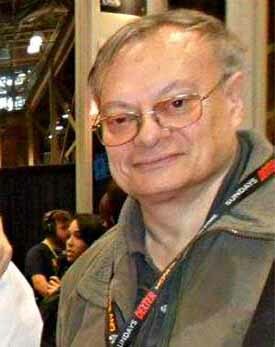 Paul Kupperberg did not arrive at 666 as a marketer; I was his successor at 75 Rock when he left to freelance. Thanks, that confirms what we thought. 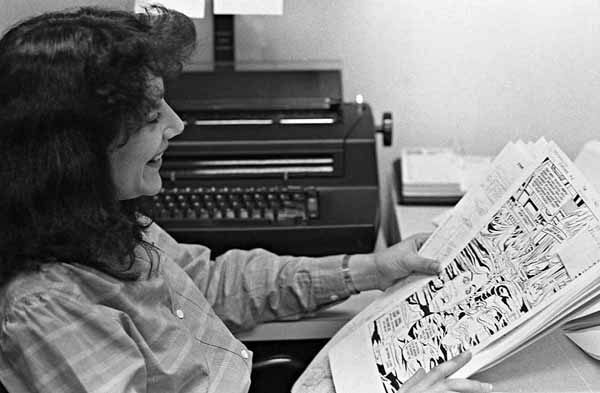 Did not know that the awesome Vertigo editor Karen Berger was the early 80s editor for Tales of the Legion of Superheroes. Wow. No wonder she carried over the streak into the Vertigo titles. I’m currently collecting TPBs of old Legion of Superheroes comics from the late 70s to 80s. Thanks Todd. Hope to be able to work with you too someday. I would love to know if ANYONE besides Jenette Kahn genuinely liked that wallpaper.